Today starts a one week school break. Time really flies, there goes term 1. My girl didn't have her CA 1 term test, some how that didn't erase my concern. Actually I wish she has it so that I can gauge her learning ability. Really dread the mid year exam as I do not know how much she has absorbed to help her to fill up the void. Last Saturday, I was helping out with a family programme for the school (organised by SFE (Singapore Family Education) and was surprised to see kids still coming back to the school. There were ballet exam, kids preparing for Indian dance competition next month and a Chinese composition competition. My son too needed to be in soccer training for two days this week. Now tell me what life kids have these days? Anyway, I have a list of baking and cooking lined up for my kids since they will be taking three meals at home. 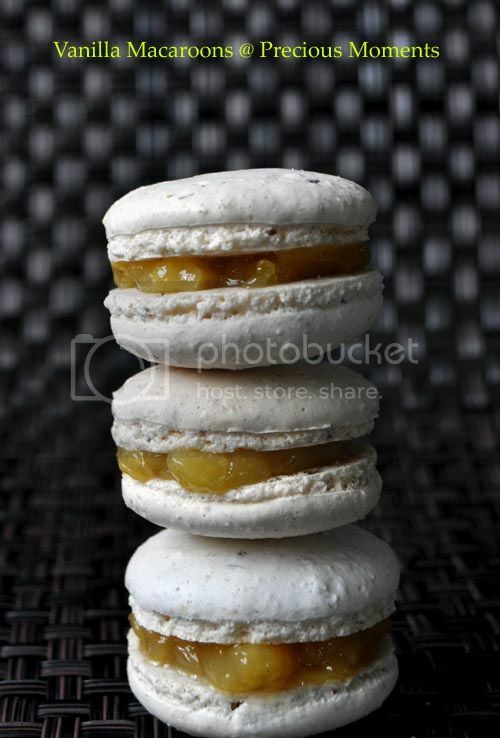 To entice my son, I also have Vanilla Macaroons with lemon curd. Not again, lemon curd! Somehow, I find the lemon curd really offset that sweetness of this chewy cookies. Perhaps I should have been more adventurous. Let's see whether I still have time to come up with more macarooning fun. I'm also submitting this post to this month Aspiring Bakers #17: March Macarons Madness! (Mar 2012) hosted by Alan of Travellingfoodies. Pulse almond meal with icing sugar in blender/mill and sift once. Mix almond mixture with 37gm egg white and salt. Set aside. Cook sugar and water until it reaches 118 ºC. When the syrup reaches 105 ºC , beat egg white until medium peaks. When syrup reaches 118 ºC , pour it into egg whites with beaters running on low speed. Pour almond mixture into meringue and fold (not stir) until batter is able to fall without trace after a count to 10. Preheat oven to 150 ºC (fan off). 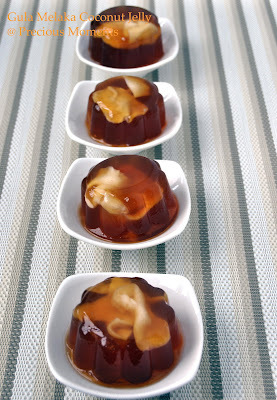 Next for dessert, I had prepared Gula Melaka Coconut Jelly. With the abundant of fresh coconut going on sales at a steal of 3 for S$2.90, I just couldn't resist. The inspiration came after hubby tried out a drink during one of his business lunch. I tried to replicate it and it was close, according to hubby. Decided to turn it into jelly instead so that my kids won't know it is coconut juice. Somehow, they are not a big fan of this juice. Don’t ask me why. By adding gula melaka, I was afraid it might be way too sweet. Surprisingly, the drink turned out to be perfect. So for this jello, I didn't add in any sugar except gula melaka. Personally, really love this combination, it brings the flavour to greater heights. Crack open the fresh coconut and remove juice. Set aside. Using a metal spoon, scrap coconut meat out. Set aside. In a saucepan, combine half the coconut juice with the gula melaka. Stir till gula melted. Combine coconut juice and konnyaku powder, stir to break down the konnyaku powder. Combine both coconut juices together and bring to boil. Using a tablespoon, pour some jelly into the jelly mould. Add in the coconut meat and pour jelly over it. Gorgeous cookies and I love pleasant tangy kick of the lemon cream. 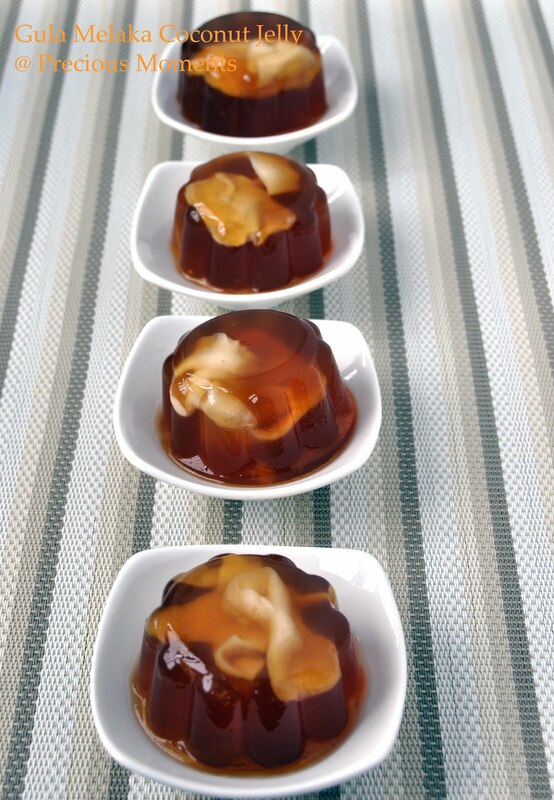 Coconut jellies is a delicious end to any meal. Ooh, so Alan's hosting this! Must try to bake something to support :)... and I can't believe that it is school holidays again! i would have thought you will be baking and cooking less since now it's school holidays but you're doing the opposite, you're a dedicated mum!very pretty jellies, edith! Yes, it's school holidays, yay! How time flies! Look at your macarons, it looks so yummy! The jellies look so refreshing, I like the coconut flesh in them! I like the taller feets you have! Yes I totally agree.. Schools stuff their kids with so much activities that they hardly have a breather, despite it being the "school holidays" officially. Such an irony huh? And because of that, teachers are busy throughout the whole week as well. SYF rehearsals and practices intensify this week, there are also lots of school zonal competitions for various sports. So I really wonder who is enjoying the holidays!!! Beautiful macs:) I love using tangy flavours in macarons as well! Really helps to balance the sweetness from the shells. Bake away gals! Looking forward to seeing more of your macs! Edith, you are really good in making these two sweets. Your macrons are perfectly baked. 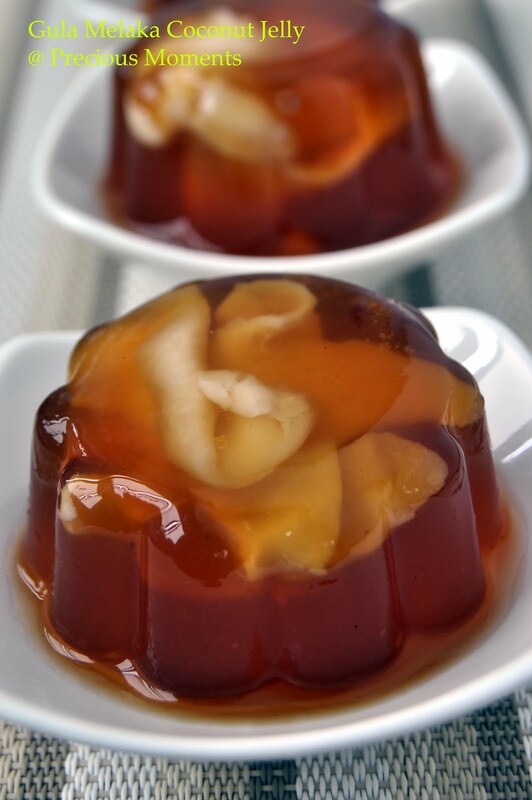 And your coconut jelly looks very refreshing and perfect too for a nice and relaxing tropical afternoon. Poor little kids...they have so many to do these day but I think your son and daughter are so lucky to have a mum like you. Hi Bee, await for your 2nd batch. Shirley, yes Alan is hosting it. Lena, kids stay home so will seek food. Thanks Quizzine, how is life? Alan, hope I can come up with more unique flavour but moi not so adventurous. Zoe, maybe my girl will think I am a good mom but I doubt my son feels that way. I like tangy fillings for my macarons too otherwise it will be too sweet for my taste. Your macarons look professional so are your jellies. NICE!